A cross between Memento and Curious Incident of the Dog in the Night-Time, this is a unique, breathtaking page-turner about a girl with no short-term memory and her remarkable journey to find the one boy able to penetrate her fractured mind. Seventeen-year-old Flora Banks has no short-term memory. She lives under the careful watch of her parents, in a town she is familiar with, among people who are equally familiar with her story. She has not been able to recall any part of her past since she was ten, when the tumor that was removed from her brain took with it her ability to make new memories. That is, until she kisses Drake, her best friend's boyfriend, the night before he leaves town. Miraculously, this singular memory pierces Flora's fractured mind, and sticks. Flora is convinced that Drake and their shared kiss are responsible for restoring her memory and making her whole again. So when an encouraging email from Drake suggests she meet him on the other side of the world, Flora knows with certainty that this is the first step in reclaiming her life. With little more than the tattoo "be brave" inked into her skin, and written reminders of who she is, how old, where she lives, and why her memory is so limited, Flora sets off on an impossible journey to the land of the midnight sun--Svalbard, Norway. There she is determined to find Drake, and to explore the romantic possibilities and hopeful future that their reunion promises her. But from the moment she arrives in the arctic, nothing is quite as it seems, and Flora must "be brave" if she is ever to learn the truth about herself, and to make it safely home. When I first heard of The One Memory of Flora Banks by Emily Barr, I was intrigued. The synopsis for the book definitely sounded interesting; I don't think I've read any books like this before, and I was really curious to see what the story was about. It was definitely an interesting read! Flora Banks is a seventeen year old girl who suffers from short-term memory loss after having a tumor removed from her brain when she was 10. She lacks the ability to make any new memories at all, until one night on the beach, when she's kissed by her best-friends boyfriend, giving her a memory that she actually remembers. This kiss sets the course to change Flora's world forever. So, I went into this book thinking it may be similar to the movie 50 First Dates, where Drew Berrymore, who also has short term memory loss, wakes up every morning not remembering what happened the previous day. This book is very similar, though Flora has an extremely short-term memory. She can remember things for mere hours, before it's forgotten again. With the help of a notebook and sticky notes, as well as messages written on her arms, she is able to remind herself of things, which definitely helps. But how frustrating this has to be for her! Reading the story from her perspective was interesting. I don't know how she did it, but she did, and it was quite an interesting journey she took throughout the book. I liked that the book kept me guessing, and there's an interesting twist towards the end of the book that I probably should have been coming, but didn't. Also, this was a really quick read for me; I read it in just a few hours time. 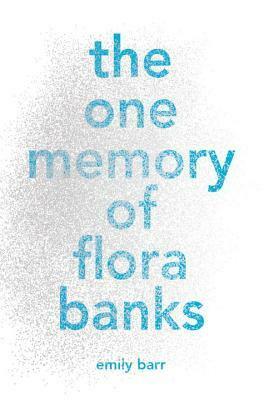 Overall; The One Memory of Flora Banks was an interesting read! I don't think I've read many, if any, books like this before, and I was definitely fascinated. I'm really curious to check out more of Emily's books in the future! Ha! I totally thought it was going to be like 50 first dates too! *great minds* I actually liked this book. Barr did a great job creating this brave heroine, and I loved! her brother.